While Western New York is not as well known for it's inland trout fishing, our area has numerous beautiful streams and rivers that support both wild and stocked populations of brown and rainbow trout. We also have excellent insect hatches in the spring and summer, which our trout key on and are great fun for the dry fly enthusiast. We offer guided and instructional trips for trout on one of our many quality Western New York trout streams. Our trout trips are designed for you to enjoy the experience of one of our area's beautiful streams as well as becoming a better fly fisherman (or woman!). 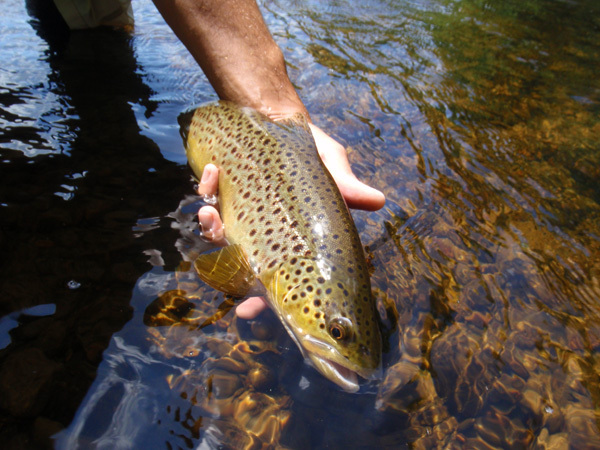 Our trout trips can be designed to be mainly instructional in nature and represent an on-stream trout fishing class. CCO owner Vince Tobia was born and raised in Western New York and has spent over 30 years fishing this area. He knows where to find the fish and how to catch them, and will share his knowledge with you. He has a United States Coast Guard Captain's License and is a N.Y.S. Registered Guide. NYS licensed guide Rick "Fishman" Fisher is the newest addition to our team. Rick has been fishing our area for many years and he knows our local waters well, and is an excellent guide. He is a patient teacher and loves to be outside on the water helping guests catch trout. We also work with several other western New York licensed guides who have spent years fly fishing & exploring our streams and will provide a productive, informative and enjoyable day on the water. Our goal is to teach our guests the proper fly fishing techniques used to catch trout, as well as how to hook, fight, land and properly release them. We strongly support local conservation efforts. Vince is a Trout Unlimited life member, previously served on the Board of Directors for our local Western New York chapter, and was formerly the editor for the chapter's monthly newsletter. Both Vince & Rick are dedicated conservationists and passionate trout fishermen. All trips require a $100.00 deposit upon booking. This deposit is fully refundable if the trip is canceled at least one month prior to the scheduled date. If more than two weeks notice is given, the deposit will be applied to a future trip. If less than two weeks notice is given, the deposit will be forfeited unless the date can be filled. In the event of un-fishable stream conditions in the entire region, this deposit will be applied toward a future trip. For those planning to fish a specific river, if that river is un-fishable we will fish an alternate river.